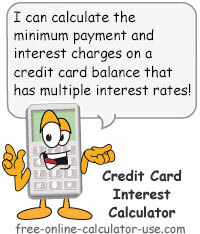 This calculator will calculate the current interest charges for a card balance containing up to 3 different APRs. The calculator is an alternate version of the finance charge calculator that highlights the unethical payment allocation method often used by credit card companies. Instead of entering a fixed payment amount, this version allows you to enter the actual minimum payment percentage and smallest minimum payment dollar amount as stated on your monthly statement. The calculator then determines the minimum payment amount for you. Additionally, instead of just showing a 60-month payment allocation comparison, this version shows the comparison until both allocation methods have paid off the balance. Calculate current credit card interest for a card having multiple rates (purchases, cash advances, introductory). Enter the minimum payment percentage for the card (usually somewhere between 2% and 5% of the balance). Enter as a percentage, but without the percent sign. Enter the smallest payment allowed by your credit card company, but without the dollar sign. For example, if your statements reads, 2% of the balance or $15, whichever is greater, you would enter 15 as the smallest minimum payment amount. If your credit card has one, enter the annual fee, but without the dollar sign. The calculator will take 1/12th of the fee and add it to your current finance charge. Enter the penalty APR as stated on your credit card statement, but without the percent sign. The calculator will use this entry to show you what will happen to your monthly finance charge if you are late making a payment. If you will be entering a balance transfer amount below, select the number of months the introductory rate will be in effect for. Expand the description in each of the following rows to enter the beginning balance, current charges, and interest rates for each interest rate balance. Expand the entry form in this row and enter the beginning balance, current month transfers (if any) and the interest rate for this portion of the overall balance. Leave off all dollar signs, percent signs, and commas. Expand the entry form in this row and enter the purchases beginning balance, current month purchases (if any) and the interest rate for purchases. Leave off all dollar signs, percent signs, and commas. This is the total of all sub-balances and new charges on your credit card. This is your current minimum payment based on the entered minimum payment percentage. If this result does not match the actual payment, you may need to adjust the minimum payment percentage in the top section of the calculator. This is the current interest charge for the low introductory rate portion of your balance. This is the current interest charges for the purchases portion of your balance. This is the current interest charges for the cash advance portion of your balance. This is 1/12th of the annual fee you are paying to have the card. This is the total current finance charges plus 1/12th of the annual fee. This is how much your finance charges would be if you had been late making one of your past monthly payments. This row shows the number of payments and interest cost that will result if you make only the minimum monthly payments and if your credit card company applies the principal portion of your payment to reducing the lowest rate balance on your card (unethical payment allocation). This row shows the number of payments and interest cost that will result if you make only the minimum monthly payments and if your credit card company applies the principal portion of your payment to reducing the highest rate balance on your card (ethical payment allocation). Note that if you only entered data for 1 sub-balance type, then this row will be blank. This row shows the additional payments and interest costs due to the unethical payment allocation by credit card companies. Note that if you only entered data for 1 sub-balance type, then this row will be blank. Enter the minimum payment percentage from your credit card statement. Enter the smallest dollar payment amount allowed by the credit card company. Enter the annual fee, if applicable. Enter the penalty APR as listed on your statement. If one of your balances came with an introductory rate, select the number of months remaining in the introductory period. For each APR listed on your statement, tap the info icon to enter the balance at the start of the billing cycle, additions during the billing cycle, and the balance's annual percentage rate. Click the "Calculate Card Interest" button and scroll down to view the results.